The Spring Latch is reliable, low cost, used primarily on hinged doors and panels. The simple barrelbolt fastener has many practical applications throughout the electronic cabinet and industrial equipment industries. Smooth, trouble free action combined with easy access and secure closure make the Spring Latch ideal for inspection doors and access panels. Paneloc Spring Latches are fabricated from quality materials including stainless steel, cold rolled steel, and aluminum in a variety of finishes. They are available with optional widths, hole patterns, forms and pin styles. Easy and inexpensive installation can be accomplished using screws, rivets, or by welding. A unique design feature of the Paneloc Spring Latch is a special C-Ring that acts as a positive-stop retainer, preventing spring over-travel or snagging. The C-Ring also provides secure pin retention and eliminates jamming. 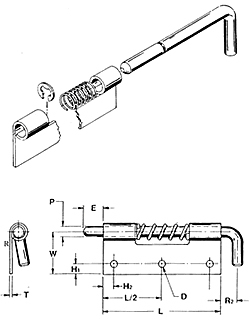 The tempered spring is properly tensioned to provide smooth positive pin release and return. Most commercial finishes are available including zinc plate on steel, passivate and electropolishing on stainless steel, and anodize on aluminum.